I love instant gratification projects, a few hours work (or less) and tada....a finished project. So I'm trying to figure out why I keep working on blankets. They are as far from 'instant' gratification as you can get, they're more of a 'long-suffering' gratification. I officially started another blanket today, it's become a bit of an addiction I think. 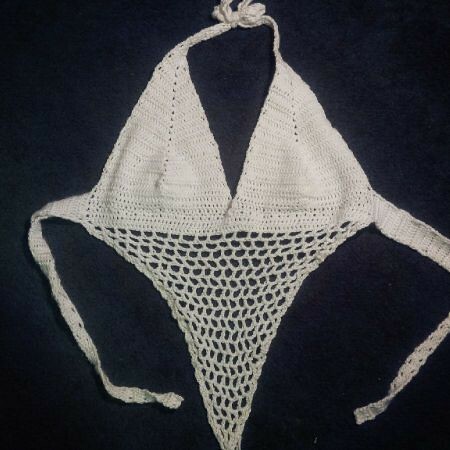 I started and finished a mesh-ish bikini top from a DROPS pattern. This is a first because when I started yarning I avoided DROPS patterns like the plague. I found the instructions too vague and hard to follow for a novice. Now that I'm less of a beginner I thought I'd give one a chance and surprisingly I completed it. I did a few modifications in the chest and mesh and left off the tassels. While I don't look like a tanned beach beauty like in the DROPS picture I am quite pleased with how it turned out. Everytime I'd try the top on to check the fit, Guiness would attack the loose strings. I'd put it on and make my way to the mirror with a cat behind me chasing the tails. 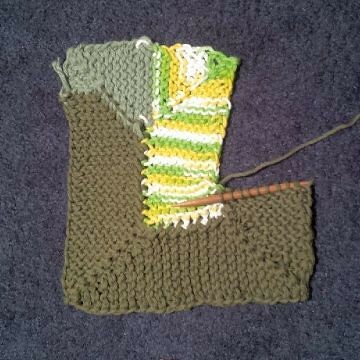 I started another ten-stitch 'blanket' but I'm using cotton and am going to make it dishcloth sized. 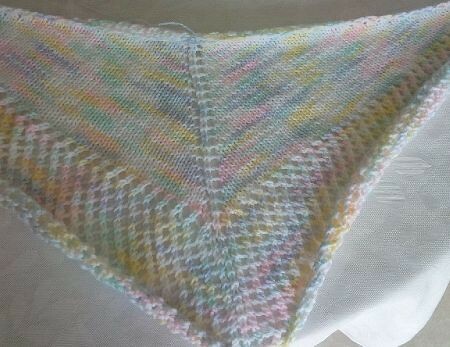 It's a gift for someone who admired my other blanket. 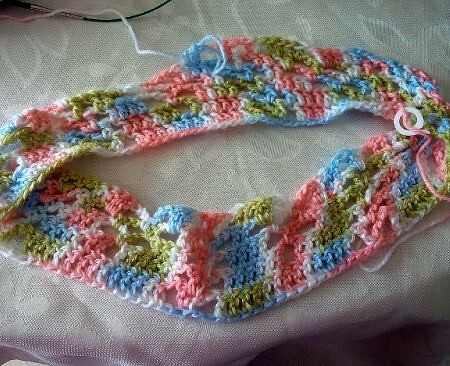 I couldn't imagine starting another full-size one so I opted to do a dishcloth. I did the middle square properly on this iteration and it looks so much neater! Everytime I look at my ten stitch blanket I grimace because I messed up the middle part, it curves instead of being a square. It straightened out after a few rows but it still bugs me (Not enough to rip it back though). It's only for me, and I'm sure I'll get over it, because the only other option is to give it away. 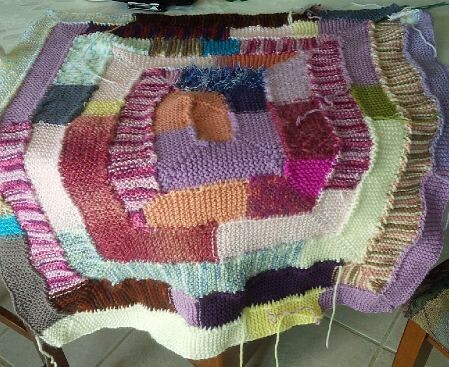 Whenever I work on the blanket in public I get comments, people are fascinated by the construction of it, knitters and non-knitters alike. Someone mentioned the free-form nature and the mix of textures and told me I could hang it on the wall as an art-piece, I'd never really thought of that. I finished my cursed shawl from the last post, I found two more mistakes in the eyelet bit and decided to ignore them. It's bound off but hasn't been blocked yet. It was initially for me but I think I'm going to have to give it away because the mistakes make my eye twitch. My primrose cowl is coming along slowly, I find the pattern isn't easy to memorize so I have to have it with me and that makes it hard to do while someone is talking to me or while watching TV. 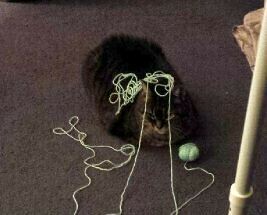 Guiness in her post-yarn ball playing pose. I have a specific ball of yarn I use to play with her, it works most of the time to distract her from my project. She shouldn't keep things all balled up.